Welcome to the Wild Card Event that lasts 48-hours! Build lineups with the current MLB postseason teams in the Wild Card Event! Events have their own dedicated lineup, but you only can use player items from your Inventory. Players from the Yankees, Twins, Diamondbacks and Rockies are eligible to enter the Wild Card Event. The player items can be Live Series, Legends and Flashbacks. Your team overall is 99 OVR, so build your best teams possible! Don’t forget, you can filter the Community Market on TheShowNation.com by each team. 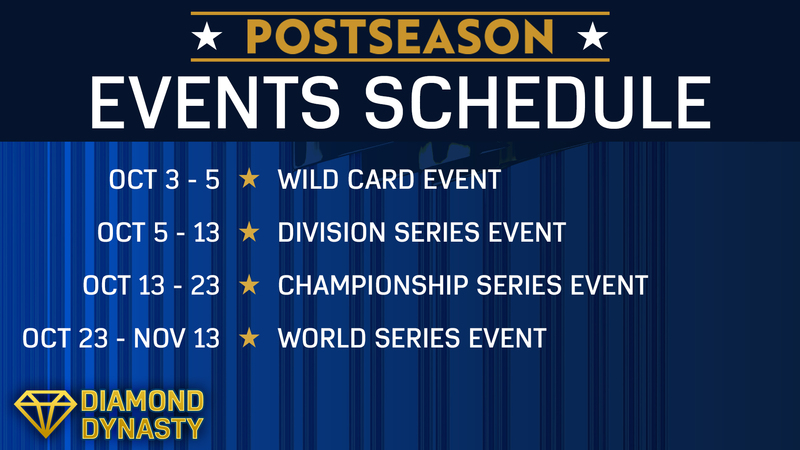 The Wild Card Event consists of only 3-inning games. Look under the Time Limited Mission category for new Exchange missions to choose the National League and American League Wild Card Winners. 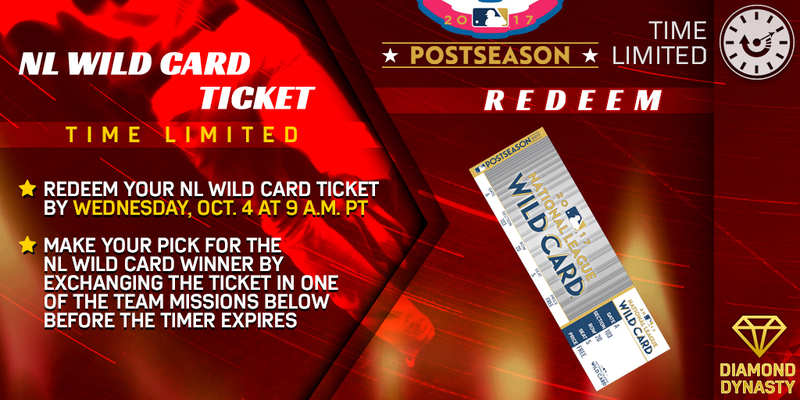 Redeem your Wild Card Ticket items and then choose your winners by exchanging each Wild Card ticket. One update we want to pass along about the Postseason Events is that we relaxed the team overall restrictions. For all Postseason Events, it will be 99 OVR, which means you essentially have no restrictions to build the best possible Event lineup out of the eligible player pool. Each player pool will be determined by the current MLB Postseason round. For example in the Wild Card round, players from the Yankees, Twins, Diamondbacks and Rockies are the only ones allowed to add to your Event lineup. If you receive an error that says you don’t have enough players to enter the Event, please try to build your 25-man roster in your My Squad screen. It may help identify where you have positions to fill. You need a C, 1B, 2B, 3B, SS, LF, CF, RF, plus 5 hitters on your bench. On the pitching side, you need 5 starters and 7 relievers (Relief or Closing pitchers) in your bullpen.